Looking Up, I Wonder . . .
does she feel guilty about her expanding curves? with saltwater slurps in a hazy horizon? when winds blow them off course? has developed a score of its own? Written for dVerse, the virtual pub for poets, where today Bjorn asks us to write a poem that consists only of questions. And indeed, we are looking to the skies as Cape Cod is under a tropical storm watch tonight and tomorrow, expecting residuals of Hurricane Jose. The sun, the moon… I love how you used human emotions and vulnerabilities here. Enjoyed this. Lovely metaphors & inquiries–your questions are superb. Your last stanza is killer. Thanks, Glenn. Enjoyed this prompt. 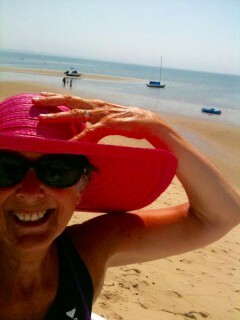 Alas, we are back from Cape Cod…never did get to OLN on Thursday…enjoying our ocean respite too much. Will need to go there just to read your Buck story…I’m assuming you added another chapter/verse? 🙂 Will do so in a bit. Lil, I love this poem. Your questions are amazing! A very inquisitive mind.. This was filled with mystical questions. The last stanza is a real gem. So glad you enjoyed, Truedess! when winds blow them off course?” The winds must blow those clouds all over. Glad you enjoyed. Somehow, while on Cape Cod, looking at the sky and the horizon and the ocean is just what you do….so….voila! So much I love here… there is a feeling of a child asking questions. Some things you cannot answer really. I also got to think about the BC comic strip that I think would fit some of the questions… Especially the frustrated cloud works for me. I love questions about the sea and sky! It is their right not to answer! Is such a gorgeous image, even if the sky does feel belittled. But, I always thought they (sky and sea) were trying to mirror one another in admiration and love. ….except when the storms blow in! 🙂 Or the fog covers all and it’s like the sky says, “forget it….I’ll just cover you with this clammy grey/white fog so no one can see your beauty! 🙂 Glad you enjoyed. Yes, you gave human emotions to nature. I love the imagery here, very perceptive and creative questions. So glad you enjoyed! Thanks for stopping by 🙂 Really appreciate it! And now, you’ve got me wondering too! Thanks for this glimpse of your gaze, Lillian! Great personifications of nature! I especially like the sun and the moon. Surely those clouds in your photo have some answers! This is a great astrological reverie! That guilty moon! i’m going to have another biscuit in sisterly solidarity. You put things into perspective beautifully.